By Natalie Zmuda . Published on September 17, 2012. At least two days a week, Andrea Harrison sits among entrepreneurs hunched over tables in long rows inside a bright, airy space dotted with tchotchkes and hipster accents -- an oversized stuffed giraffe, a tree stump end table, a stylishly concealed keg. The room is hushed, like a less stuffy, utterly unpretentious college library. There's not a suit in sight. Ms. Harrison hardly works for a startup, but as the director of digital engagement at PepsiCo Beverages, she does toil alongside entrepreneurs at WeWork Labs, a co-working space dedicated to early-stage technology companies. Ms. Harrison , like the hopeful entrepreneurs in the office, applied for -- and pays for -- a desk. She stumbled across the space while serving as VP-strategy at Razorfish. Over dinner, a couple of startup founders who had just secured their Series A funding told her they planned to move into the space. She was intrigued. Shortly thereafter, she accepted a job reporting to Shiv Singh, global head of digital at PepsiCo, and she and Mr. Singh hatched the idea of connecting with the founders of early-stage companies by working within their earshot. PepsiCo believes so much in the importance of early-stage companies that , on average, 10% of the digital-media budget across its beverage brands in the U.S. is invested with startups. Since 2010 the company has supported PepsiCo10, an incubator program. PepsiCo boasts of working with FourSquare when it had just 30,000 users and believes its Brisk iced tea was one of the first brands to use Instagram. Beyond the company's own efforts, OMD's Ignition Factory helps to identify startups and helps facilitate the building of relationships. Still, PepsiCo wanted to delve deeper. These four companies have worked with Digital Labs. Here's what they do. What it does: GoChime is a social-marketing platform that lets brands tap existing fans connect with potential customers. What it does: Enables brands to provide rewards to casual mobile gamers for in-game achievements. What it does: Uses mobile-image-recognition technology to allow consumers to interact with company logos. "One key insight [is ] you can't just do competitions, temporary engagement, check the box," explained Mr. Singh. "We decided to formalize a relationship, to really think about how to bring infrastructure to supporting startups, helping them help us." PepsiCo's result is Digital Labs. The program, which for now just focuses on the company's beverage brands, was formalized earlier this year. It has a mission statement and a defined structure for working with startups. 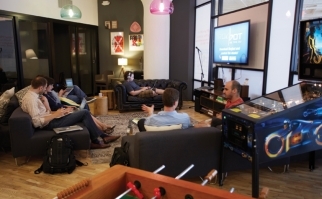 Many, but not all, of those startups come to the brand through WeWork Labs relationships. "[Digital Labs] grew out of this need to not always rely on agencies or partners to bring us ideas or introductions to not just startups but to a lot of the disruptive marketing products that are reaching consumers," said Ms. Harrison . "In the old world, the agency was really the one that was bringing those ideas. Well, once we hit 2007, 2008, the ideas were coming at you fast and furious. We realized we had to be front and center with these companies." In stage one of a Digital Labs relationship, PepsiCo offers mentoring and insights, as well as networking opportunities. Ms. Harrison holds office hours at WeWork Labs, where, she said, she "never" turns down a meeting. But PepsiCo also has connected with startups via word of mouth and other relationships. Ms. Harrison met Kiip's founder during her Razorfish days and Pongr was discovered via a consumer post on Twitter. In stage two, the "seed round," PepsiCo provides opportunities -- and limited funds -- to test and develop new products. If all goes well, the startup graduates to stage three and pitches for campaign work. Often Ms. Harrison coaches the startups, teaching them how to pitch and how to respond to a request for proposal. Once a startup is proven, it begins competing with "the big boys" and is perhaps added to the company's preferred vendor list. "This is not about donating to someone's startup," said Ms. Harrison . "This is about looking at how we can use our working dollars to get a big program from a startup, which can turn into an actual solid vendor we work with down the road." 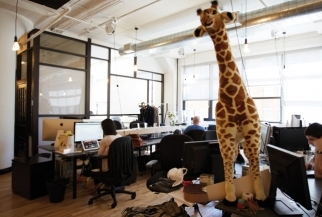 WeWork Labs quickly outgrew its original space in New York's SoHo neighborhood that housed 49 entrepreneurs. The new space, also in SoHo, comfortably holds 220 people, spread out on several floors. To keep overhead low, sponsors such as PepsiCo, Microsoft's Bing.com, legal firm Wilmer Hale and JWT have been brought onboard. "We really wanted to make it as easy as possible for early stage companies, and one of the big hurdles is money, so we use some of the sponsorship money to subsidize the rent," explained Matt Shampine, a co-founder of WeWork Labs, during a tour of the space. "We really try to give them as many resources as we can, so they can focus on building the product." But it's not just about big companies' cutting a check, he added. Mr. Shampine and his partners seek out sponsors that bring something to the table, whether it's legal advice, human-resources expertise or, as is the case with PepsiCo, insight into how a big marketer works. Sponsors also host seminars and happy hour events. In return, they get access to startup culture and perhaps the next big app or social-media platform. A desk in the open loft space costs $300 a month, while the rent for private offices can range from $700 to $3,900. Those prices give entrepreneurs 24/7 access to lounges, private phone booths, meditation rooms, kegs of beer, fair-trade organic coffee and all the Pepsi they can drink. There are four to five events per week, ranging from happy hours to seminars on seed funding and IPOs. A comfortable lounge space looks plucked from a West Elm catalog, with modern furniture, casually arranged throw pillows, a foosball table and a pinball machine. A framed quote declaring, "When we're together, we're cooler than everyone else," adorns one of the walls. It is a community space in demand. The wait list has nearly 900 people. "We have some people that we're never going to be able to get to leave," Mr. Shampine joked. "But our goal is to help companies outgrow our space as quickly as possible." The average stay is about eight months, though some entrepreneurs stay longer as they create different products. And others boomerang back, upgrading to bigger offices after completing accelerator programs such as those offered by DreamIt Ventures, NYC Seed and ERA. A group of entrepreneurs sitting around a table in a WeWork Labs conference room is eager to get one point across: More brands need to be doing what PepsiCo is doing. Yes, they admit, brands are getting involved -- there are contests and competitions. There are small pieces of business up for grabs, though it helps to have connections. Kraft Foods, now home to PepsiCo alum Bonin Bough, was described by the group as a company that "gets it." But, by and large, companies are not getting down in the trenches. They are not focused on developing long-term relationships. "With Pepsi and with a company like ours that 's focused on CPG, to be able to share [a product] with a brand early on and get feedback and understand how they might use it, it's an opportunity not usually available to a startup," said Ryan Charles, co-founder of Consmr and a WeWork Labs tenant. "There are a lot of companies that engage with startups," added Chris Kobran, VP-brands and strategic partnerships at Kiip. "But you've got to have a relationship. You've got to get to where you can pick up the phone and say, "What do you think? ... Be honest.'" Owners of startups that work with PepsiCo paint a symbiotic picture. They have access to the execs that influence big budgets, and they interact with key marketers on brands such as Pepsi, Mtn Dew and Brisk. They might not always like what those execs have to say, but at least they get answers. "We've made all these assumptions. The blue chip investors have given us millions of dollars to prove those assumptions. And you need blue chip clients to help you prove out those assumptions," said Mr. Kobran. "[The brands] have 1,000 people calling them trying to do that , so it's really important, from our perspective, to have that access to validation." Added Josh Emert, co-founder of GoChime and another WeWork Labs tenant: "As a startup, the most valuable thing you have is time. You have to figure out what works fast. What Pepsi is doing is really a shortcut to a decision maker where you can get quick feedback." Ms. Harrison says the team at PepsiCo has a vested interest in providing plenty of feedback, given that they've already invested the time and money. And, ultimately, PepsiCo's goal is to build relationships with the startups, so if they hit it big, they're inclined to remain loyal. "They get bought by Google or become the next big thing, and then they're in a position to give us an exclusive in the category," Ms. Harrison said. "So instead of getting on a plane and going down to Atlanta, [home of Coca-Cola], they stick with us." The plan, so far, seems to be working. Jamie Thompson, CEO of Pongr, said he feels "incredibly loyal" to PepsiCo, so much so that he's made it clear to his staff that only PepsiCo products are acceptable thirst quenchers. Still, it's clear that any startup must watch out for its own interests. "You can get nudged and nudged. There can be a divergence of interests," Mr. Thompson said. "What a big CPG company wants is not always what the startup is dreaming of . You have to ask yourself. Does it make sense? Is it scalable, repeatable?" Indeed, in an environment where agencies and brands are all looking for the next big thing, it's easy to wonder whether this whole startup environment isn't a bit of a fad -- a bubble that will burst at some point in the not-so-distant future. "It's easy to start a company. So, yes, the huge influx of startup companies is a fad," said Ms. Harrison . "But the opportunity for brands to keep ahead of the game, especially with marketing and media, that 's not going anywhere." In exchange for small amounts of monetary support, expertise and discounted products and services, sponsors attract new clients, build awareness and goodwill in the startup community, and find out what's new and next in the tech space.